Drama students at The Sixth Form College, Solihull took part in a Devising and Physicality Workshop with Frantic Assembly Theatre Company this term. The College-based workshop prepared students for the Devised Play component of the A level Drama & Theatre course. 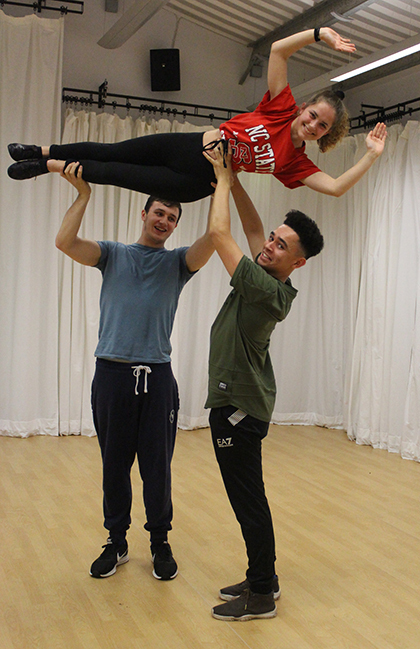 Year 13 students took part an intensive six-hour workshop with a member of the Frantic Assembly Theatre Company, exploring many of the trademark physical theatre techniques that students will be able to use in their own devised work. A leading practitioner in contemporary theatre, highly recommended by the AQA exam board, Frantic Assembly are renowned as the company behind the award winning ‘The Curious Incident of the Dead Dog in the Night-time’ at the National Theatre and now in the West End. The workshop followed hot on the heels of this group of these students’ second visit to see the company’s ‘Things I know to be True’ at the Curve Theatre in Leicester.